A 79-year-old woman, with no relevant past medical history was admitted due to an idiopathic acute pancreatitis. Magnetic resonance cholangiopancreatography (MRCP) revealed a focal main pancreatic duct (MPD) stricture in the pancreatic head with moderate upstream dilatation (7 mm), as well as prominence of secondary branches. In the uncinate process, a 17 mm cystic lesion with no apparent communication with the MPD was also described. This acute episode had a good clinical course and the patient was discharged. One month later, she underwent another MRCP that showed no evidence of the aforementioned stricture but pointed a 9 mm dilatation of the MPD at the level of the pancreatic head. Serum CA 19.9 and CEA were normal. Four months later, she was admitted due to a new episode of mild acute pancreatitis. At that time, she was referred to our institution for endoscopic ultrasonography (EUS). This exam revealed a lesion in the pancreatic head along with an atrophic pancreatic parenchyma, with lobularity, hyperechoic foci and stranding. 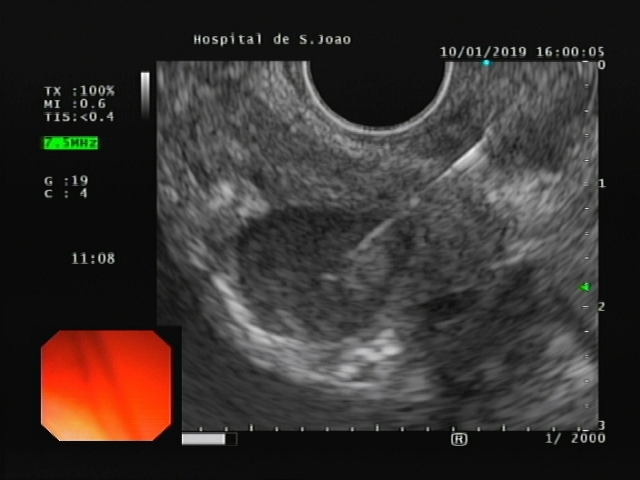 Elastography and contrast-enhanced harmonic EUS (SonoVue®) were performed. 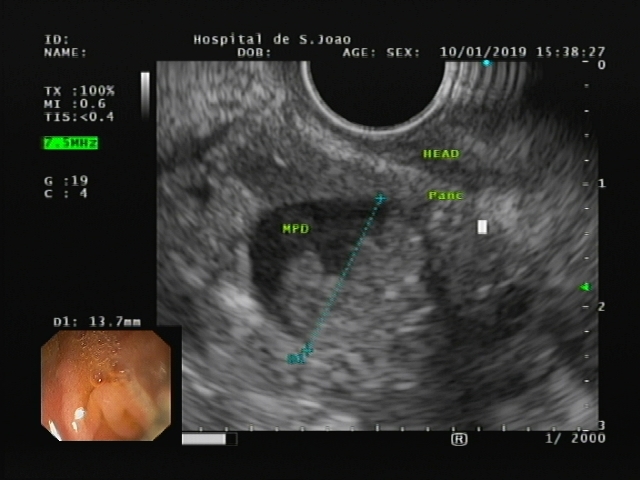 EUS revealed in the pancreatic head a cystic dilatation of the MPD (15×15 mm), with a hyperechogenic solid component and digitiform projections that conditioned almost complete occlusion of the duct (Figure 1). Figure 1. 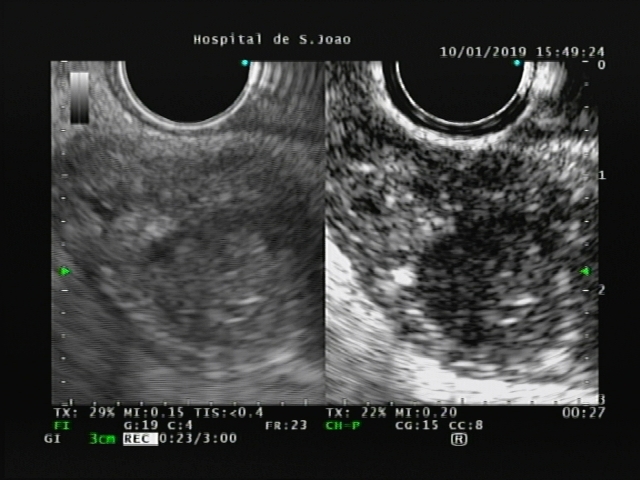 EUS: cystic dilatation of the MPD (15×15 mm) in the pancreatic head, with a hyperechogenic solid component and digitiform projections that conditioned almost complete occlusion of the duct. The solid component had a “hard” pattern on elastography (strain ration 18.79; Figure 2) and revealed an heterogenous enhancement after contrast administration (Figure 3). Figure 2. 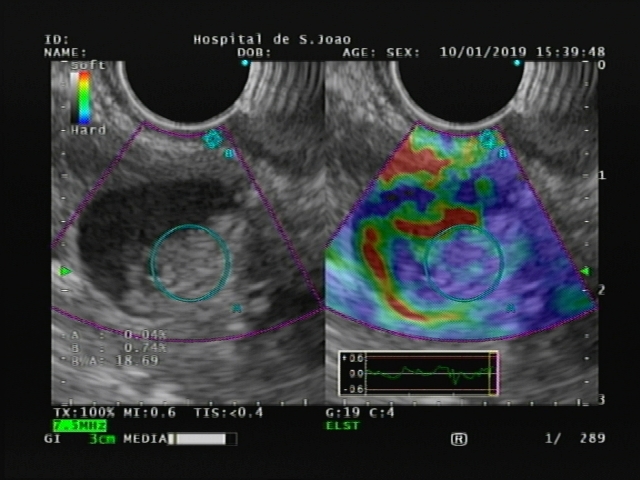 EUS elastography: solid component showing “hard” pattern. Figure 3. Contraste enhanced EUS: solid component showing heterogenous enhancement after contrast administration. Fine needle aspiration (FNA) of the cystic and solid component was performed (2 passes with a 25G needle, 1 pass with a 22G needle; Figure 4). Figure 4. EUS: FNA of the solid component. Cytology examination revealed hyaline material, epithelial cells (CK19 positive), compatible with an IPMN with atypia (Papanicolaou Classification IVB). In the cystic fluid analysis, elevated amylase (40602 U/L) and CEA (719 ng/mL) levels were present. Serum CA 19.9 level at that moment was remarkably increased (1316 U/ml; normal range 0-37 U/ml). After multidisciplinary discussion of the case, it was decided to repeat EUS-guided sampling. Fine-needle biopsy (FNB) with a 25G needle (2 passes) was then performed, with rapid on-site evaluation (ROSE). Cytology examination confirmed the diagnosis of IPMN with high-grade atypia and adenocarcinoma (Papanicolau Classification VI). A CT scan showed contact of the lesion with the spleno-portal confluence, and the patient was proposed for neoadjuvant chemotherapy with gemcitabine. Pancreatic cancer (PC) is a fatal disease with a 5-year overall survival of less than 6% [1,2]. A recent European study showed that PC is the fourth leading cause of cancer-related death in men and women . Because the vast majority of patients with PDAC remain asymptomatic in its early phase, interests are now focused on the detection of high-risk individuals (HRIs), so that they can undergo screening examinations for early detection [4,5]. IPMN accounts for less than 10% of all pancreatic neoplasms and particularly IPMNs with high-grade dysplasia are associated with a significantly increased risk of invasive PC . There has been a continuous effort of International Societies to establish guidelines for the management of patients with pancreatic cysts being difficult to judge which one should be adopted. As stated by William Brugge , the most important is to decide whether the guidelines should be designed to detect early neoplasia (eg, high grade dysplasia), as in Sendai-Fukuoka ones, or late (invasive) neoplasia, as in the case of AGA recommendations, taking also into account the patient’s global health and the site of the cystic lesion. Our patient presented with repeated attacks of acute pancreatitis, associated with MPD dilation, which raised the suspicion of a main duct IPMN, a lesion harboring a high risk of invasiveness. In this setting, EUS with FNA/FNB is a crucial tool for confirming the diagnosis and access the presence of malignant changes . In fact, the crescent use of this technique is important in order to allow for a correct diagnosis and staging in a usually asymptomatic and very challenging population. Kosmidis C, Sapalidis K, Kotidis E, Mixalopoulos N, Zarogoulidis P, Tsavlis D, et al. Pancreatic cancer from bench to bedside: molecular pathways and treat- ment options. Ann Transl Med 2016;4(May (9)):165. Khorana AA, Mangu PB, Katz MHG. Potentially curable pancreatic cancer: Amer- ican society of clinical oncology clinical practice guideline update summary. J Oncol Pract 2017;13(June (6)):388–91. Malvezzi M, Bertuccio P, Levi F, La Vecchia C, Negri E. European cancer mortality predictions for the year 2014. Ann Oncol 2014;25(August (8)):1650–6. Tanaka M. Intraductal papillary mucinous neoplasm of the pancreas as the main focus for early detection of pancreatic adenocarcinoma. Pancreas. 2018;47:544–550. Moutinho-Ribeiro P, Coelho R, Giovannini M, Macedo G. Pancreatic cancer screening: Still a delusion? Pancreatology (2017) 17:754–65. Machado N, al Qadhi H, al Wahibi K. Intraductal papillary mucinous neoplasm of pancreas. N Am J Med Sci 2015;7:160. Brugge WR. Pancreatic cyst surveillance: threat or opportunity? GastrointestEndosc 2016 Jun;83:1118e20. Canto MI, Goggins M, Hruban RH, Petersen GM, Giardiello FM, Yeo C, et al. Screening for early pancreatic neoplasia in high-risk individuals: a prospective controlled study. Clin Gastroenterol Hepatol 2006 Jun;4:766e81. Gastroenterology Department, Centro Hospitalar de São João, Porto, Portugal. Pathology Department, Centro Hospitalar de São João, Porto, Portugal.